Summary: This is a Disney movie, so replete from extremes, but still full of drama and at its heart has a great story. 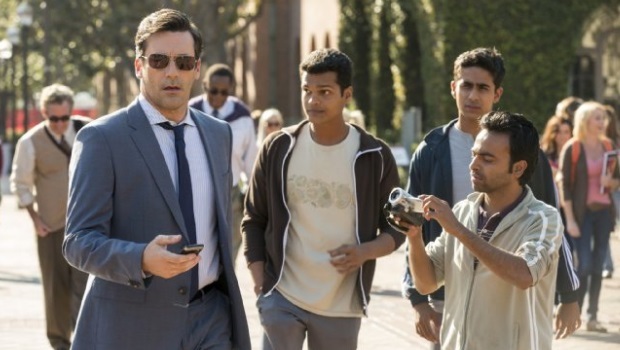 We join Million Dollar Arm at a crucial time in protagonist J.B. Bernstein’s (Hamm) career. He’s a baseball talent agent whose three major clients have now retired, and final prospect is on the verge of signing with a rival sports corporation. Rent is overdue, and salaries are getting harder to justify… Despite the fact J.B. only dates supermodels1, it’s suffice to say – things are looking bleak. It’s one evening whilst flitting channels in his plush condo, that he has a revelation courtesy Indian cricket and our very own Susan Boyle (I assure you I’m not making this up…) He comes up with the idea of a baseball talent contest based in India to tap into its obvious cricket talent, and double up as a great marketing opportunity (Mad Men hangover?) for scouts and media in the USA. On his arrival in India, J.B. is typically the fish out of water, coming to terms with Delhi belly, irreverent livestock, and IST – that’s Indian Standard Timing for the uninitiated (confirmed time +2 hours / weeks, delete as appropriate). He gets to grips with colloquial idiosyncrasies pretty fast, be it greasing palms, partaking in village rituals or the ‘yes’ means yes, no or maybe mentality. After regional trials, J.B. finds his potential pitchers in Rinku (Sharma) and Dinesh (Mittal) bringing them back to America for training, with less than a year to bring them upto pro-league standard. Coming from humble rural backgrounds, the boys find it hard adapting to the new environment and demands. Most of all, they need some warmth and support… It’s here that we get to the crux of the story, and the key to the MacGuffin. We’re all looking for something, yearning or dreaming of something – be it love, more money, better health, that one amazing opportunity, or simply a better life… The characters in this movie have their respective hopes and aspirations, but it’s only in understanding one another’s needs and helping each other, are they able to fulfil their own. It’s kinda surreal watching the iconic ‘Don Draper’ in present day, that too in the land of colour, curries and Kamasutra. He rightly describes it as ‘a study in extremes’, whilst coming to terms with his new environs, and his own situation. It’s only much later in passing banter with his lovely tenant (& neighbour) that his real catharsis begins, and J.B. (and the movie) develops a lot of heart. The PR junket describes this movie as Slumdog meets Jerry Maguire, and to be fair, it’s not far off. But this is a true story which neither of its predecessors can claim to be, and all the more authentic for it. The characters are endearing and suitably cast, especially Sharma (Life of Pi) Mittal (Slumdog Millionaire) Bell and the brilliant Alan Arkin. Hamm makes the tricky transition from small screen to celluloid, and it’s a pretty convincing solo lead debut. It’s also supported by a stomping soundtrack by A R Rahman featuring Iggy Azalea, Drake, Lil Wayne, Lady Gaga, Kendrick Lamar and K T Tunstall. As a Disney movie it’s replete from extremes, but still full of drama and at its heart has a great story.